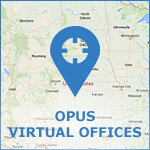 Opus Virtual Offices offers exclusive Premium Locations throughout the US. Premium locations provide more than just Virtual Office Services. These locations have additional services like conference rooms, free internet, coffee shops, lobby, reception areas, private parking and much more.